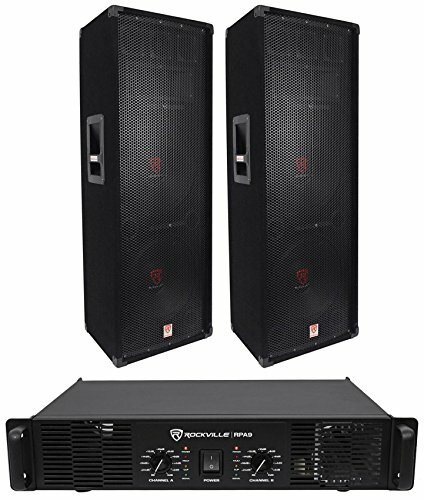 The Rockville RSG-12.2 speaker system features two high quality 12" low frequency woofers with three electronic, high-efficiency piezo bullet tweeters and one high efficiency piezo compression horn tweeter to provide a true full-range of sound. This speaker produces an incredible amount of power. 2000 Watts peak, 1500 Watts Program Power, and 1000 Watts RMS Power. With 60 Oz magnets, you can be sure these speakers will produce the power you expect out of them. Rockville RSG-12.2 Carpeted Passive Loudspeaker. (2) 12" Pro Audio Woofer. (3) Piezo 3" Bullet Tweeters. (1) High Efficiency Piezo Compression Horn. RMS Power: 1000 Watts. Program Power: 1500 Watts. Peak Power: 2000 Watts. 2" High Temperature Aluminum Voice Coil. 4-Ohm Impedance. Sensitivity: 102dB @ 1w/1m. Frequency Response: 40Hz - 22 kHz. SpeakON Input connection. ¼" In/Out connections (Parallel). Dimensions: (15.4+8.6)x12.5x40.5in. Weight: 44Lbs. Rubber Isolating Feet. Construction: High-Density, High-Quality Non Resonant Particleboard, Stapled, Bonded & Braced. Rockville RPA9 3000 Watt Peak 2 Channel Professional/DJ Rack Mount Amplifier. 2U rack space. Bridged and Stereo output switch makes this perfect for (2) subwoofer, (2) speakers, or (4) speakers. Built in crossover switch allows make this perfect for speakers, monitors, or subwoofers. Channel A & B Clipping Led Indicators. Channel A & B Separate Level Controls. Power, signal, overload, clipping, and protection LED indicators on front of amp. Heavy duty rack mount ears with handles. Built-in dual high velocity quiet cooling fans. Maximum headroom for 4-ohm and 8-ohm Speakers. Level controls for precise setting and matching of sensitivity. Computer controlled IC protection circuitry against speaker short circuit, thermal over load, DC over load. User serviceable fuse (5A, 250V). Distortion: <0.03% . Input Impedance: 20K Ohm Balanced and 10K Ohm Unbalanced. Signal to Noise Ratio: > 102dB. Power Requirements: 120V / 50-60Hz. Weight: 17.19 lbs. Dimensions: 18.97 x 13.97 x 3.54 inch.